Homestretch! We're in our last block of movies of Project Valentine now. The final four. At this point, I'm ready to finish the month just so I can get back on a normal sleep schedule again - I'm exhausted from staying up so late each night. I couldn't think of a better name, so I have designated this block of movies as Heavyweights; these are movies that were suggested to me by multiple people. Now, when I solicited suggestions, I got lots of them, and obviously I haven't used them all, although I tried to incorporate several. But among those suggestions, there were a few that had several supporters, especially the two that I'm going to end the month with. Today, I watched Love Story, the #9 entry on AFI's 100 Years, 100 Passions list. Also? The screen debut of Tommy Lee Jones. Also? Nominated for Best Picture of 1970, but defeated by Patton, which if you know me you will know is one of my favorite films of all time. So instead of wrting about Love Story tonight, I will be listing all of the reasons Patton is awesome. The opening monologue in front of the American flag. Ryan O'Neal plays Oliver Barrett IV, a Harvard student from a very wealthy family. At the school library, he meets Jenny Cavalleri (Ali McGraw), a confrontational Radcliffe student. The two hit it off, fall deeply in love, and decide to marry, despite his parents' objections. Oliver is accepted to Harvard law school, but Jenny must work to support them, because his father has cut them off. He graduates near the top of his class and is hired by a prestigious NYC firm. Now that the couple is doing well, they decide to have a baby, but are unable to conceive. A consultation with their doctor reveals that Jenny has only a short time left to live. As she undergoes therapy, the medical bills grow larger than Oliver's ability to pay them, and he is forced to swallow his pride and ask his father for money, but won't tell him why. After Jenny dies in his arms, he leaves the hospital to see his father waiting for him and offering an apology. He responds with a line that Jenny spoke to him earlier in the movie after a fight: "Love means never having to say you're sorry." Jennifer: I wouldn't go out for coffee with you that's what. One thing you don't have to have seen the movie to appreciate, although it helps, is that Roger Ebert coined the term Ali McGraw disease after seeing it. Ali McGraw disease is a "Movie illness in which the only symptom is that the sufferer grows more beautiful as death approaches." Zing! 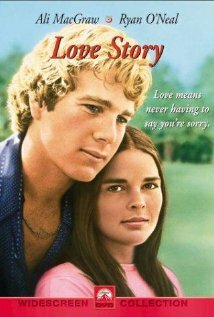 RATING - Forty years after its release, Love Story doesn't feel that original anymore, but it holds up. I give it four Pattons out of five. LESSON - Love means never having to say you're sorry. Also, Patton is awesome. Weeds taught me thug means never having to say you're sorry. Love means saying sorry, and trying to mean it, even when you're not. The book is better. Your favorite dialogue comes straight out of there! But the movie is Ok. Another one that I watched because I felt I had to and wasn't sure why everyone raves about it. I have never been able to sit through Patton. But I'm a girl. THANK YOU! "Love means never having to say you're sorry." I've been trying to parse that and figure out how it applies to my relationships for 20 years. Complete and utter horseshit. Anya, by way of Weeds, is spot on: bucking up and saying sorry when you think you both should but you know she won't, or when you just flat-out don't think you should, that's love. The greater good of the team. Never having to say you're sorry? That's the Middle East. Or just another day at the UN. And maybe, just maybe, US foreign policy. But that's another story I suppose. P.S. Danny, my compatriot, I know this may damage our friendship, but by my scorecard Patton (deep breath) ranks only 3 Pattons out of 5. I like both of your analyses of this movie's most famous line. And Will, we're good. The after-movie discussion is more lively if there's some disagreement anyway. It's a statement that sounds profound and beautiful when you hear it (especially if you have to say sorry a lot, i.e. you're male). But if you spend more than five seconds actually considering it, or are ever in an actual relationship, you realize what 70's "be true to yourself" bunk it is. It's somewhat analogous to the name of Homer's barbershop quartet, the B-Sharps.